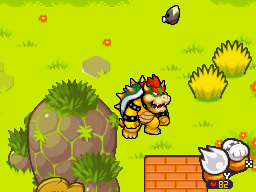 Bumpsy Plains is a small grassy area from Mario & Luigi: Bowser's Inside Story. It is located west of Dimble Wood, north of Cavi Cape, east of Blubble Lake, and south-west of Bowser Path. It is filled with many Flifits, as well as Sneeds that only Mario and Luigi can fight. A Chakroad is also located around here and there are only four Beans hidden throughout the area. 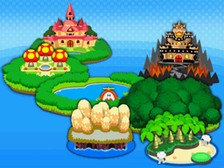 The music played here is the same as the music played at Blubble Lake. A hidden Squid Fit is found here. Somewhere, there is a trapdoor activated by body-slamming. It is hidden in the ground. 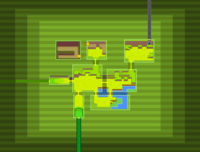 The following are overworld items found in this area. Safety Ring In a brick behind a rock in the eastern scene. Star Candy In a brick in the northwestern underground area. Minion Band In a brick accessible by exiting the northwestern underground area. Heroic Patch In a ? Block in the northwestern underground area. There are 4 Beans in total. Otapuku Sōgen Mumps Meadow - Otapuku comes from おたふく, otafuku, meaning mumps. French Prairie O'Rayon O'Ray Meadows, pun on "oreillons" ("mumps"). This page was last edited on December 27, 2018, at 22:18.